Great food. Good service, it was super busy and they kept up just fine. Still let us eat even though they were closing in 10 minutes. Just a great hometown restaurant. Food was very good..special instructions followed well. Staff was very accommodating and friendly. Food was great and staff was very friendly. Was not in the mood for fast food and this hit the spot. Good family place. Long wait times can happen from time to time. Home cooking not at home. 10/10 The staff is what makes this place worth it. Delicious food and great service!!! Very friendly family owned local restaurant. Good food great service. The service is top notch but it just a regular cafe. The staff is amazing, and this is the place for a good home cooked meal! We had steak sandwiches their great! This place is amazing have been going since I was a child. Love going back good is great love there salad bar. We found this to be a very family friendly restaurant that was able to accommodate a large group with several small children. The waitress was very patient with the kids and made our experience quite pleasant. The food is ok, but boring as hell. They haven't updated the menu in 30 years. Good salad bar. 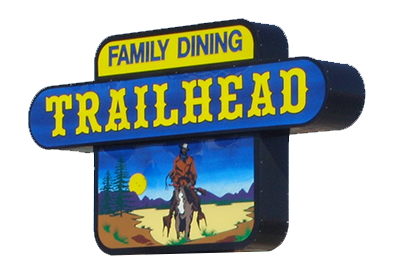 we had a recent wedding rehearsal dinner at the "Trailhead"-very well done-the staff was great-would highly recommend this restaurant! We went for lunch today, two of us had chicken the chicken fried chicken special. It was really good and mashed potatoes were yummy. It is a very friendly place to go. Good food and excellent service. The biscuits and gravy are excellent. I always go here when I'm craving a good breakfast burrito, and get the sweet potato fries. My favorite ones in town. The waitress seemed unhappy, but overall a good eating experience, as always. Good food at good prices. I highly recommend Trailhead! First time visit to Riverton for Ron Thon wrestling tournament. The staff was friendly, wait for food was relatively short, food was good and inexpensive for the amount they served. I'd recommend for breakfast if you're passing through or here for a short stay. I’ve had breakfast and dinner here. We’re not from Riverton but stop here whenever we are in town. Quick and friendly service and tons of great good! Love the salad bar. Prices are fair. It truly is a family-friendly restaurant! Food and service was good and didn't have to wait long. The best salad bar of your life. I would go 5 stars if they paid there cooks properly. The do have a tip jar for the cooks, use it, they deserve it! Trailhead tonite-great service, great food. Great food, great service! Been going there since I was a kid, always good place to go! We were passing through and decided to stop for lunch. It was a nice family restaurant and the food was served warm and the service was very friendly and effective. Extremely good food and customer service! Don't miss this experience. Good value. Nice atmosphere. Good place to eat. It was a Saturday late morning visit. People eating both breakfast and lunch. Was crowded. But we received our food fairly quick. We had breakfast and all was good. Would definitely recommend. Normally good service, food meets expectations as for burger and fries but decent enough and plenty of parking. We went for breakfast early! The service was Great food was fresh and hot!